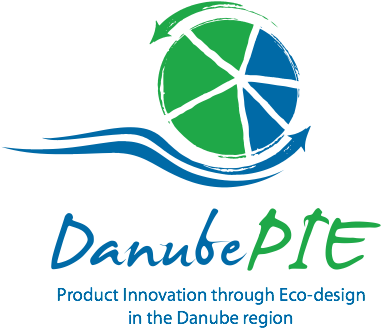 "Design your production in green way"
Danube PIE is an international project whose main goal is to raise awareness among SMEs in Danube region regarding ecodesign issues. The project is funded by the European Commission through the CIP (Competitiveness and Innovation Framework Programme). The underlying idea of the project is to provide knowledge on ecodesign which can be integrated in product development process in companies. Eco-design is an approach to the efficient use of materials and energy that should provide cost savings, preservation of the environment, increased competition and expansion into the change of existing products and processes, or the introduction of new sustainable products. What can you get by participating? EDUCATION - The project team will perform in the next two years training courses and consultations to educate SMEs in order to introduce eco tools* in manufacturing and business processes. NETWORKING - One goal of the project is to connect companies / organizations (through promotional events and roundtables) working in similar areas of manufacturing / service delivery and which have the need to improve their processes. SHARING EXPERIENCES - A certain number of selected companies / organizations will have the opportunity to attend a study tour - Eco design study trip - during the duration of the project, where the goal is for participants to share experiences and gain further knowledge in the field of eco-design applications. Application for participation in the project and education itself through training and consultations are completely free of charge. Primarily small and medium-sized enterprises operating in fields related to printing and packaging, as well as companies operating in other manufacturing sectors that have need to apply eco-design into their business. Project beneficiaries can be service providers that apply (or want to apply) eco-design concepts in their activities. What do we expect from companies/institutions? Informing the project team and external experts of existing capacity and processes, and the need for applying eco-design tools and methodologies. Based on these data, the Danube PIE team will be able to conduct in-house training to companies / institutions and provide a set of services that will enable efficient implementation of eco-design tools and methodologies to interested companies and organizations in order to increase their competitiveness. In case you are interested, send us an e-mail to een@smebg.net. Send us basic info about your company, contact person and brief description of eco tools* in case you use any. More detailed information on these and all future events we will send you an e-mail, or you can read more about on our Facebook page. Danube PIE is an international project financed by the European Commission (Competitiveness and Innovation Program- CIP) and co-financed by all the involved partners coming from six European countries. 7000 Ruse, Bulgaria, 14 Kresna Str.